I hope everyone had a wonderful Christmas/Channukah/Kwanzaa/Festivus/whatever else you may celebrate. Mine was lovely as always. My pops woke up early and began cooking the turkey, fresh cranberry sauce, stuffing and baked apples with fresh whipped cream (my aunt always brings the mashed potatoes and green beans). I watched Indiana Jones with the cat and when my brother finally woke up we had our gift exchange. I got a new set of pots and Wusthof knives. It. Was. Incredible. Then the whole family came over. We ate dinner, opened more presents and then went and saw “The Girl With The Dragon Tattoo”. Not gonna lie. It was awkward. At one point my brother leaned over to me and angrily whispered that it was the worst Christmas movie ever to see with the family. Oh well! I liked it! And now I’m in New York again! Running off of two hours of sleep! Getting ready to free-base some coffee! Hooray! And for the most part I’m done with holiday parties, but I have one more to go and I’m shopped out. If you still have some more parties to go and are shopped out like I am, I have a solution! 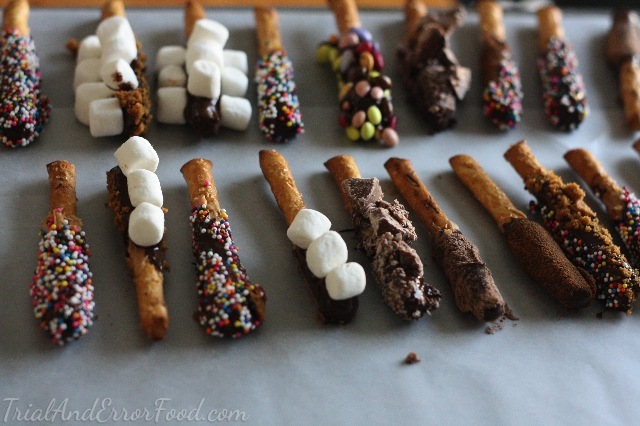 Pretzel wands. It’s another Disneyland treat, but they’re so perfect and fun, and if you plop ‘em in a cellophane bag and tie a ribbon around it, you have a present anyone will love! 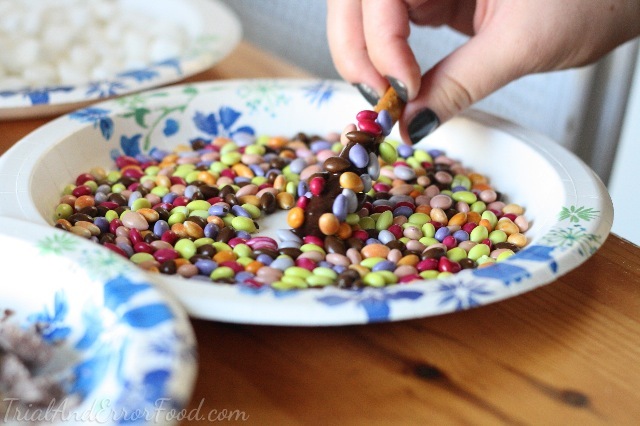 Experiment with different decorations too! Kat and I just pulled out whatever we thought would be good from the cabinets. Totally one of those recipes. 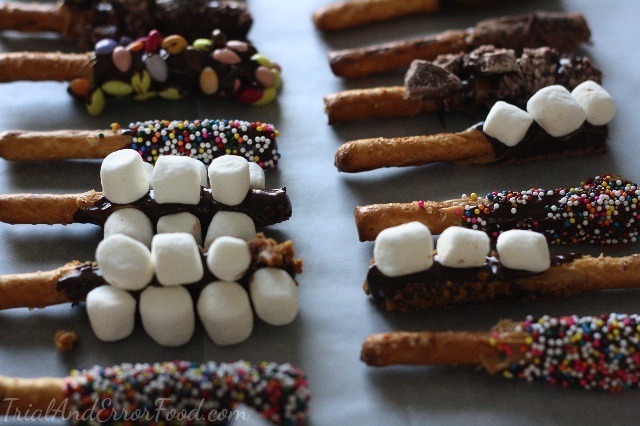 You’re going to need chocolate (I used chocolate chips from trader joes), vegetable shortening, pretzel sticks, peanut butter and whatever kinds of decorations you want. 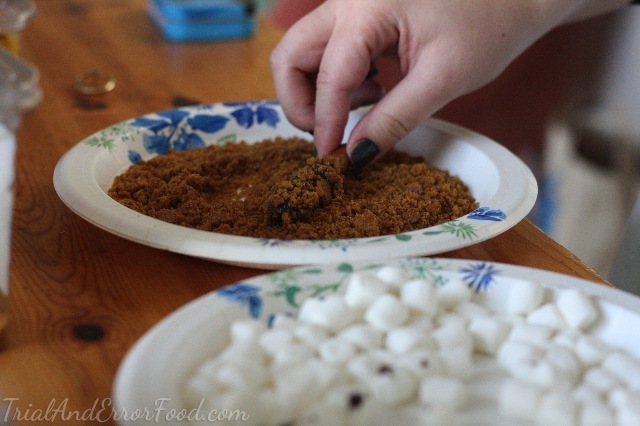 We used- cinnamon, hot cocoa powder, sprinkles, crushed graham crackers, mini marshmallows, chocolate covered sunflower seeds, and crushed up chocolate pieces. 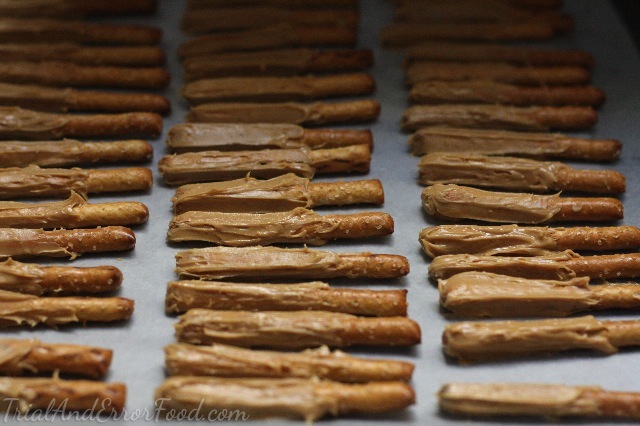 Prepare by lining a baking sheet, and one by one, using a knife, smooth over a thin, even layer of peanut butter on each pretzel stick. If you’re allergic to peanuts or just don’t like the flavor, you can skip this step. Once they’re all peanut-buttered-up, place them in the freezer. We did something like this before, remember? Fill the bottom of a medium pot with a couple inches of water. You want to be able to rest a larger bowl in the pot without the bottom of the bowl touching the water. 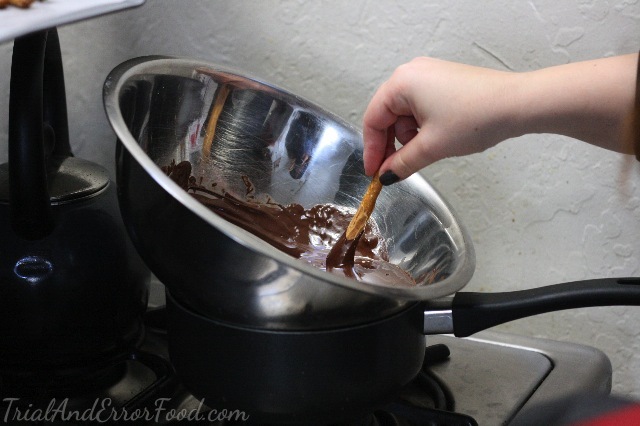 Bring the water to a boil and then set your bowl on top of the pot and pour in your chocolate. And stir until melted. Turn the stove off. Lay ‘em on a new sheet of parchment paper. Kat and I were a little concerned that they would begin to harden before we could roll them in their toppings. We started with smaller batches but we quickly learned that they take a while to set, so it was safe to dip the entire batch. And get to rolling! We set up a station of paper plates with a different topping in each. 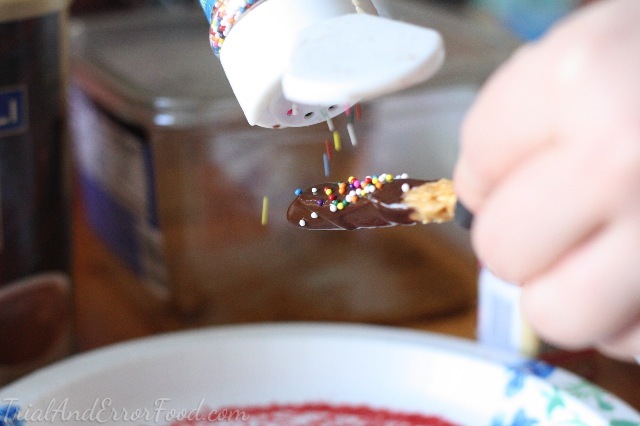 A note on the sprinkles- I first tried with the crystal looking ones, but since their color is also clear, it didn’t look like much against the chocolate. I would stick to bright rainbow colors. 1. 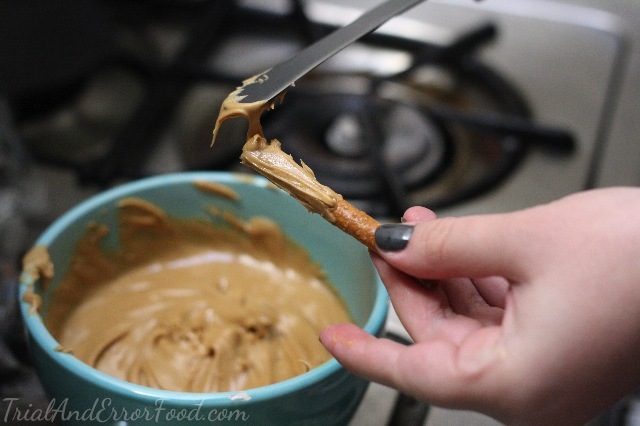 Smooth peanut butter over each pretzel stick using a knife. Arrange on a baking sheet lined with paper and set in the freezer for about 15-20 minutes. 2. Add a couple inches of water to a medium size pot. 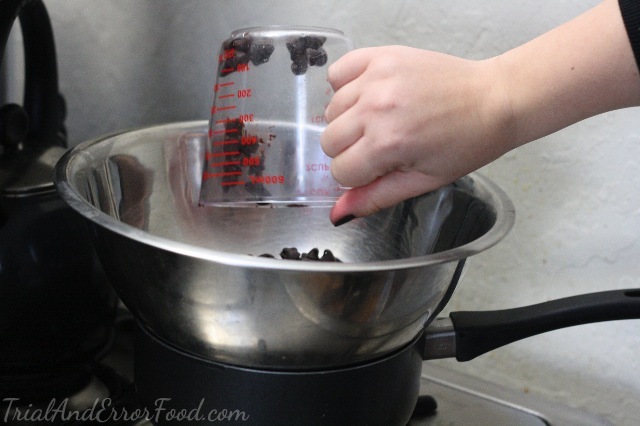 Bring to a boil and place a larger bowl over the top of the pot, making sure the bottom doesn’t touch the water. 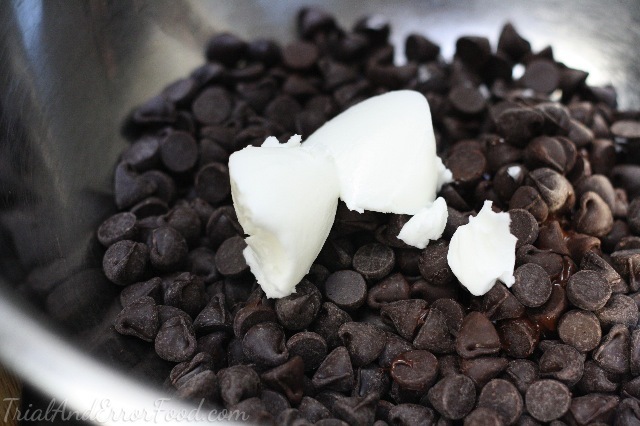 Pour in chocolate and add shortening. 3. 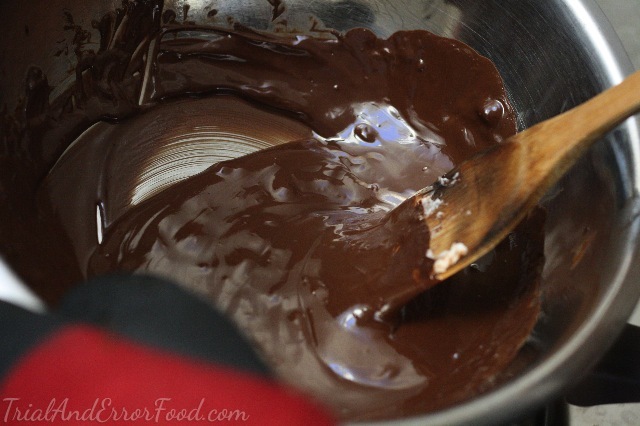 Stir until chocolate and shortening are melted and combined. 4. 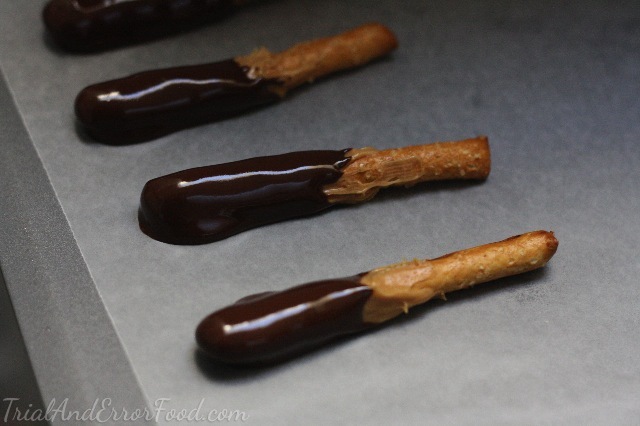 Dip each pretzel wand in the chocolate and place on a new sheet of parchment paper. 5. 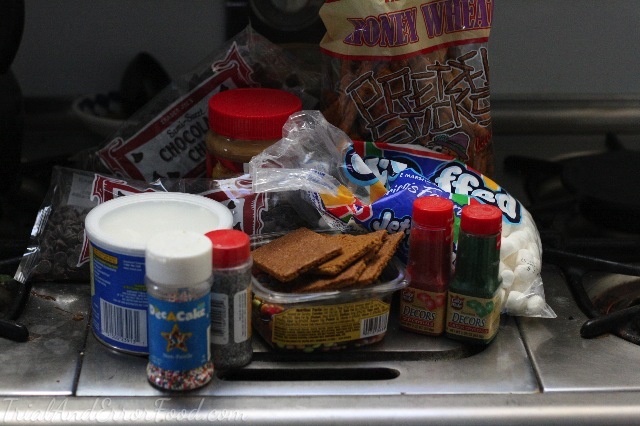 Roll in toppings and let set. You can stick ‘em in the freezer again if you’d like.